The Lozi (also known as Silozi) have their own distinct nation, Barotseland, forming a significant part of Zambia's Western Province, the heart of which is the vast Upper Zambezi floodplains. The Lozi peoples are believed to have migrated into the area from a northern Lunda-Luba Kingdom in central Africa (in what is now Zaire). This was part of one of the greatest central African Chieftainships of the 17th and 18th Century, and its success led to the waves of migrations known as the Bantu expansion. During the 18th and 19th century the people of the Aluyi establish their Kingdom among the people they found scattered in the vast floodplains of the Upper Zambezi. Lozi was the name later given to the Aluyi peoples by the Makololo who crossed the Zambezi in the first half of the nineteenth century and temporarily overthrew them (the exact date of which is unknown, but it is thought to be in the mid/late 1830s), and meaning 'plains' or 'people of the plains'. Eventually the Lozi people rose up against their Makololo invaiders in 1864. But they left their influences in their language and also imposed much of their cultural tradition on the area. The Lozi are essentially farmers and cattle herders and their culture and way of life are closely linked with the seasonal flooding of the Barotse plains, and every year during the flood period most of the inhabitants of the flood plain migrate to higher ground above the wetlands of the Zambezi in a grand ceremony. This annual movement (transhumance), which includes the Litunga, or Paramount Chief, in a highly celebrated traditional ceremony, is called the Kuomboka. The Litunga's rule was spread over many tribal groups - the Lozi based around Sesheke and Lealui; the Tonga found around the Victoria Falls area and the Ila who lived near the Kafue river. 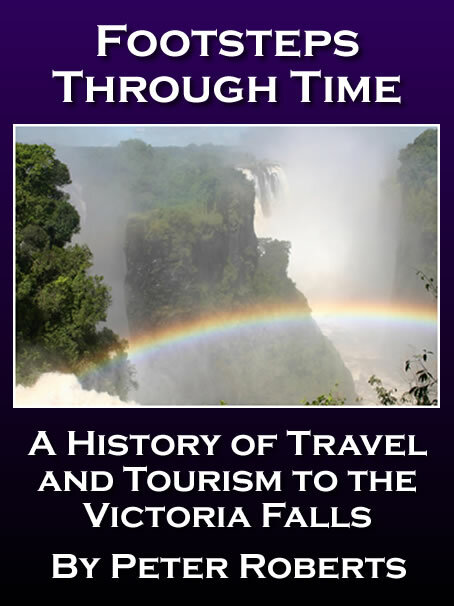 at the confluence of the Chobe and Zambezi the Barotse chiefs, whose powers are subordinated to one another, are established, guarding the principle ford of the river, the entrance to the country. No one can cross without special authorisation The chief, Mokumba, before consenting to let me pass on to Sesheke, had to forward a special message, and obtain formal permission, as all entrance to their country is absolutely forbidden to strangers. Lewanikia was never very securely established in the kingdom where he had seized power. He had to deal with two major rebellions within the first decade of his reign. In one of them, in 1884, he was forced to flee his capital and it took him more than a year to regain his throne. Westbeech thought that the Lozi kingdom was like a republic and that Lewanika lived in ‘mortal dread’ of being overthrown by the chiefs. Alfred St Hill Gibbons, hunter and explorer, who passed through the kingdom in 1895-6 and again in 1898-9 described it as ‘...a heterogeneous regime embracing a score of ‘quondam’ independent tribes, speaking many different languages, each retaining and influenced by its own tribal customs and characteristics, some governed directly by the king, others through satraps or governors selected by him from among the members of his family, and others again by subject chiefs’ The kingdom had many of the characteristics of a nineteenth–century European empire. It was large, extending over 250,000 square miles, the same size as the then German Empire, though with a very much smaller population. It was also polyglot and multi-ethnic. The ruling Lozi, or Luyi, people made up a minority of the population, even within the historical heartland of the central plain. Many of the outlying peoples, such as the Luvale, the Kaonde, the Ila and the Tonga, paid tribute to the king but were not directly ruled by him. The effective language of government was Silozi, a variant of a South African language, Sesotho, which had been imported into Bulozi in the 1840s and had become the lingua franca in the multi-lingual area. This was the language of the Kololo invaders from the south who took power in the Zambezi valley from the Luyi ruling group between the 1840s and the 1860s. Even though Lewanika controlled a state that he depended on raiding to increase or replenish supplies of labour and cattle, he continued to live in fear of attach by his more militaristic neighbour, Lobengula, and his Ndebele state. Westbeech’s death in 1888 left a power vacuum on the southern boundaries of the Lozi kingdom. Fear of the Ndebele led Lewanika in 1890 to sign an agreement with Frank Lochner, a representative of the British South Africa Company, encouraged to do so by Francois Coillard. The Lochner Concession became the basis of the company’s claims to control Lewanika’s territory. The BSAC was financed by Cecil Rhodes and Alfred Biet from the profits that they derived from the exploitation of Kimberley diamonds and Wirwatersrand gold. It had been granted a royal charter by Queen Victoria in 1889, which authorised it to occupy and control on behalf of Great Britain, the region between the Limpop and Zambezi rivers. The charter was extended to the north of the Zambezi in 1893, but the company had to fight two wars against the Ndebele and Shona peoples to establish its control in the south, and it was slow to move into the north. Lewanika always distrusted the company and hoped for a protectorate that would be administered directly by the Colonial Office in London. He knew that Khama, whom he saw as a role model, enjoyed a considerable degree of autonomy under the Colonial Office rule in the Bechuanaland Protectorate. Lewanika felt pressured by the Portuguese on the west and the Ndebele to the south, as well as political rivals at home. In 1889 Lewanika wrote to King Khama of the Bamanwato, who in 1885 had put his territory under British protection as security against the Transvaal Boers, and enquired if he was "happy and quite satisfied" with being under the protection of the "great English Queen". 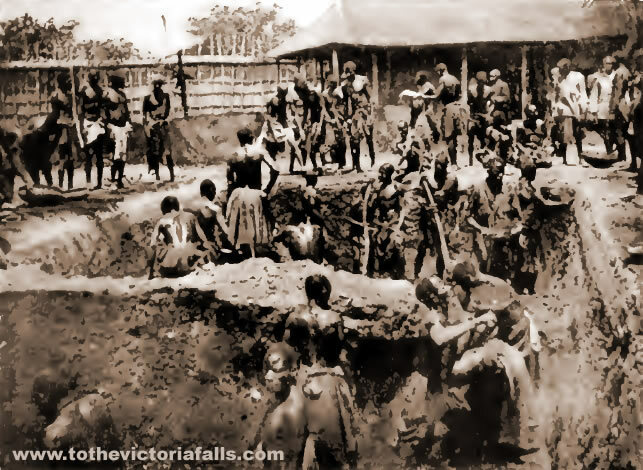 Shortly afterwards Coillard, on Lewanika's request, wrote to the British Administrator stating that the Lozi desired to be placed under British protection. “I remember distinctly my first sight of this splendid river, seeing it as I did before daylight. We had trekked through the night to avoid a belt of Tsetse Fly, or rather to pass through the belt without risk to our oxen, as they, the fly, are not so active during the night as during the day. There was nearly a quarter of a moon left, just sufficient to enable use to distinguish the Mission Station at Kazungula across the river. As day began to dawn, we were enabled to pick out the objects one by one as the greys became pinks and the dark neutral tints became greys; the sky in the east became light blue shot with red and crimson, reflecting curiously on the water. Looking up and down the river one could see the white mist rolling away from the water revealing every moment some new beauty in the shape of an island covered with tall palm trees, or tangled masses of reeds swaying slowly with the current, whose perfect surface reflected every detail of growth and cloud, which fringed it or floated overhead. Presently a diver flew partly across, and then up the river, her wings, as she flapped along coming in contact with the water, started hundreds of circles, which widening, faded, leaving a perfect mirror. Then the sun came up and everything stirred into life and my first day on the Zambezi had dawned. I turned as the boy came up to say that breakfast would be ready in a few minutes, to which, after a wash, I did full justice. We did not waste much time over breakfast. Leita, the King’s son, was to come over that morning and welcome Major Coryndon to the country as British Resident. So we put on our uniforms and the men were inspected and told the orders of the day. Shortly after this a message came from the King’s son to ask if Major Coryndon was ready to receive him. On hearing this the Major said he was perfectly ready. Then from the other side of the river forty canoes, each containing eight to ten natives, started in a body, one slightly advance of the rest. The distance from bank to bank, about 400 yards, was quickly traversed, and Leita stepped on shore. He is a tall man with a remarkably well shaped head, a pleasant smile reveals a rather prominent but splendid set of teeth, he wears a ‘Barotse’ beard on his slightly receding chin. Altogether he has a pleasing appearance. The indunas have no authority or power over the common people, or the King over the indunas, the slaves are the only people who suffer and they their owners starve and, for the slightest offence, kill. However, to return to the river. We had a long talk with the prince, amongst other things arranging about canoes to transport ourselves and goods to the capital. Letia then left us and recrossed the river. 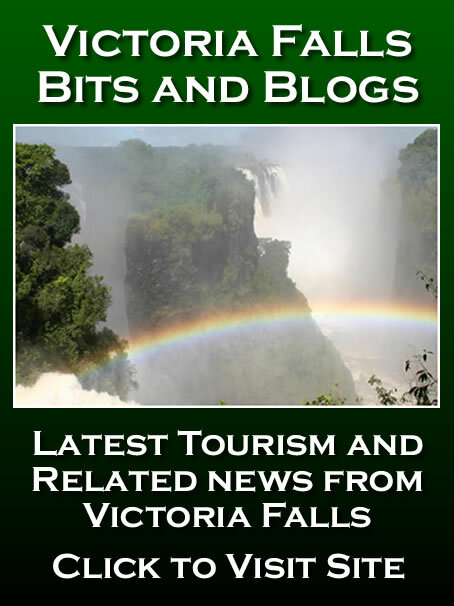 Worthington and one policeman were left at Kazungula which was then a large native town and an important place, being the terminus of the Bulawayo-Zambesi road, and the way-in to the Victoria Falls. The wagon road to the Falls was cut by Worthington in 1898, but in a couple of years or so, a more direct route was cut to Livingstone, and Kazungula fell into disuse; curious when one realises that four territories meet here. It was, and still is, used as a barge terminus for Barotseland. Robert Coryndon, one of Cecil Rhode’s protégés, a man of only twenty-seven, arrived at King Lewanika’s capital, Lealui, in October 1897 as the company’s first resident representative. Lewanika gave Coryndon a frosty reception, refusing to believe that he could represent both the British government and the Chartered Company. He only softened his stand after intervention by Adolphe Jalla, an Italian member of the Paris Mission. An order-in-council, signed by Queen Victoria, was promulgated in November 1899 and provided for the establishment of company rule in ‘Barotziland-North-Western Rhodesia’ under the supervision of the British high commissioner in Souh Africa. Coryndon was appointed administrator in September 1900. The Lewanika Concession, negotiated in October 1900, drew an internal boundary between the two parts of the British protectorate at the at the Machili River, about thirty miles west of Kazungula. Effective control of Barotseland remained with King Lewanika and was only gradually taken from him in the ensuing decade, but the company gave itself a free hand in the area that it designated as north-Western Rhodesia. Coryndon, at Lealui, was doing all in his power to get further concessions from the Paramount Chief, in order that the Company could control the expected influx into the country of settlers and prospectors, and to get more liberal powers than were contained in the Lochner Concession. 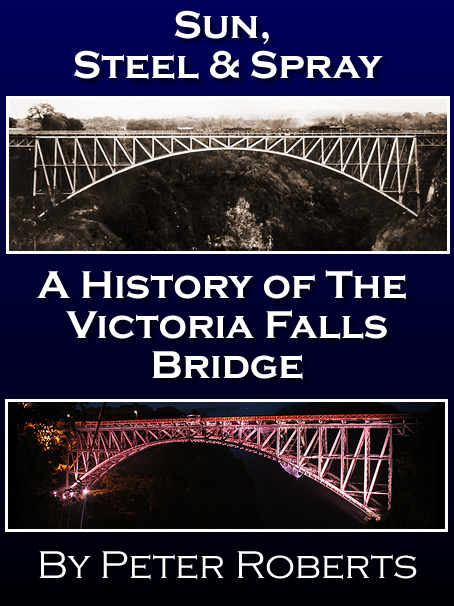 To this purpose he eventually persuaded Lewanika to travel down to the Falls with him to meet Captain the Hon Arthur Lawley, the Company’s senior representative in Matabeleland, and on 29th June 1898, Captainly Lawley received Lewanika in state. The Chief’s costume was rather remarkable; on his head he wore a black-brimmed felt hat over a scarlet night-cap; a long bright blue dressing gown, much embroidered with scarlet braid, a flannel shirt, tweed waistcoat, trousers and aggressively yellow boots completed his costume. Captain Lawley said that this was evidently his holiday attire, for on other days his scarlet night-cap was replaced by a Tam-o’-Shanter, and his dressing gown by a shoddy ulster. 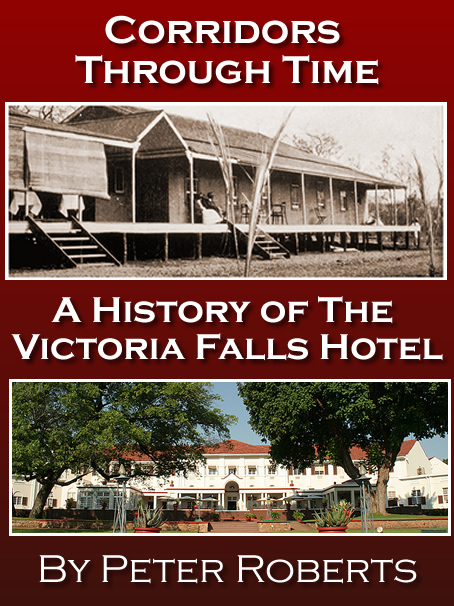 After negotiations, the first meeting of the ‘Victoria Falls Turf Club’, under the Patronage of the Royal Family of Barotseland was held. A foot race for natives caused much excitement, the Barotse defeating the Matabele, Captain Lawley’s men. Lawley’s induna informed him that this was only because he (Lawley) fed the Matabele’s much better than Lewanika fed the Barotse, so that they were far too fat to run! 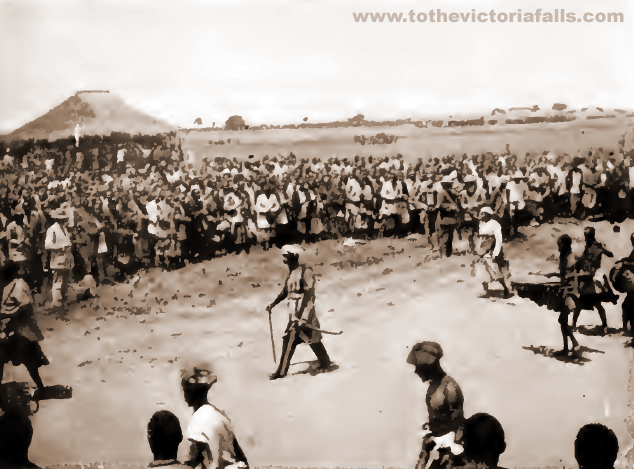 When business was finally concluded, Lewanika had agreed to a further concession but this was not ratified by the British Government until November 1901. His visit to England in 1902 for Edward VII's Coronation was a triumph and a spur for the introduction of reforms to tribal life. He set his face against established customs such as witchcraft and slavery, which in 1903 was abolished throughout North Western Rhodesia. To this day the blue Admiral's uniform which Lewanika brought back from England is worn by the current Litunga in ceremonial occasions, such as the Kuomoka. During these years, Coryndon and his men had an uphill fight to consolidate the Company’s position. The Barotse Native Police was formed and Major Colin Harding was made Commandant. During one of his tours, Major Harding traced the Zambesi to its source, a well-watered plateau 5,200 feet above sea level in the farthest corner of North-Western Rhodesia. He took a phonograph with him on his journey and carried spoken messages to the distant chiefs from the Administrator of Matabeleland and the Paramount Chief; he also brought back messages of allegiance in the same form. Kuomboka, literally means to get out of water and is the largest and most famous ceremonial festival on the Zambezi, marking the journey of the Litunga from the annually flooded wetlands at Lealui (near Mongu) to Limulunga on the forest fringes. In 1933, a palace was built by Litunga Yeta III on permanently dry ground on the edge of the plains at Limulunga. Although the Kuomboka was already an established tradition, it was Yeta III who first made the journey into an annual show and ceremony. Central to the festival are the royal barges which carry the Litunga, his possessions, the Nalikwanda and Notila, which carries the Litunga and heads the flotilla procession. The main barge is a huge painted wooden canoe, with canopied domed section. Thirty paddlers man the boat dressed in traditional costume of animal skins and scarlet headdress with a piece of lions mane. Drums play a leading role in the ceremony. 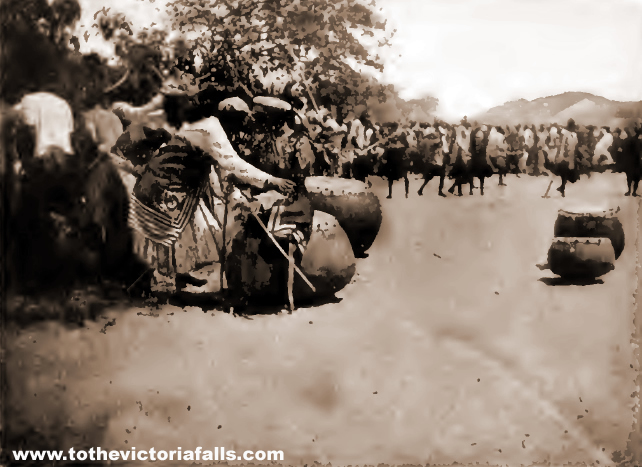 The floodplain settlements are widely spread, and the Kuomboka no fixed date, so drums are used to announce the coming departure. The Moama, or sacred war drums, are beaten from dusk to midnight, and then from 4 a.m. until sunrise, letting the community know they have one day to prepare for departure. The most important are the three royal war drums, kanaona, munanga and mundili, each more than one metre wide and said to be over 175 years old. On the morning of the departure, the tall royal drum mwenduko is sounded to signal that the Litunga will not be spending another night in Lealui. The procession of boats and barges, carrying the Litunga, members of the royal family, government ministers, and many more following, takes about five or six hours to reach the seasonal capital, Limulunga, during which time the drums are played continually, and where on arrival a huge crowd celebrates with traditional dancing and singing well into the night. The Litunga begins the day in traditional dress, but during the journey changes into the full uniform of a British admiral, complete with regalia and ostrich-plumed hat. This was presented to Litunga Lewanika in 1902 by the British King Edward VII, on his visit to England for the King's coronation, and Litunga Yeti III started the tradition of wearing it as part of the ceremony. The date of the Kuomboka is not fixed, and traditionally happened anytime in March, or as soon as the flood waters got too high for comfort, and was also tied to full moon. Today, the date of the festival is sometimes set in advance, and usually takes place in late March or early April. A return ceremony is also held, but with much less celebration and show. Lewanika died on February 4  at the age of about 74, as near as could be estimated. During all the next day, as the news spread through the country, groups of natives were to be seen wending their way to the capital in order to attend the funeral ceremonies. Custom requires that the chief's body should be transported to the burial-place, in the large canoe in which he always travelled. The body was solemnly placed in it, the eyes towards the east, but the level of the flood was not high enough for the draught of water, and so it had to be carried to the canal. There the funeral barge headed the procession of canoes, moving stern foremost. All the dead who are borne in canoes travel this way. This is a symbolic action. This pleasing anxious being e'er resigned. The Barotse attitude, however, expresses much more than this—not only a last regret, but a last resistance to the power of death. "Forced onwards, but contesting every inch, the victim of the Last Enemy resolutely turns his back so as not to see that great Victor of Heathenism, Death!" Immediately behind the pavilion which overshadows the body a woman is doubled up rather than stooping. It is Mawana, or Amatende, the only wife who followed the King at the time of Akufuna's revolution. She was with him in his distress; she now holds the place of supreme honour as chief mourner. Faithful unto death, she will watch beside the corpse during the long and tedious hours whilst the tomb is being dug. Next behind comes Nalikuanda, the great state barge, made anew each year to celebrate the inflowing floods, and to transport the king and his suite with great pomp to their summer residence. It was loaded up with piles of things which had belonged to Lewanika and were to be buried with him. Both the royal canoe and the state barge were, after the ceremony, to be brought to a deep pool, which is never dry even in summer, and sunk there, for they must never more serve to carry anyone after the death of their royal owner. 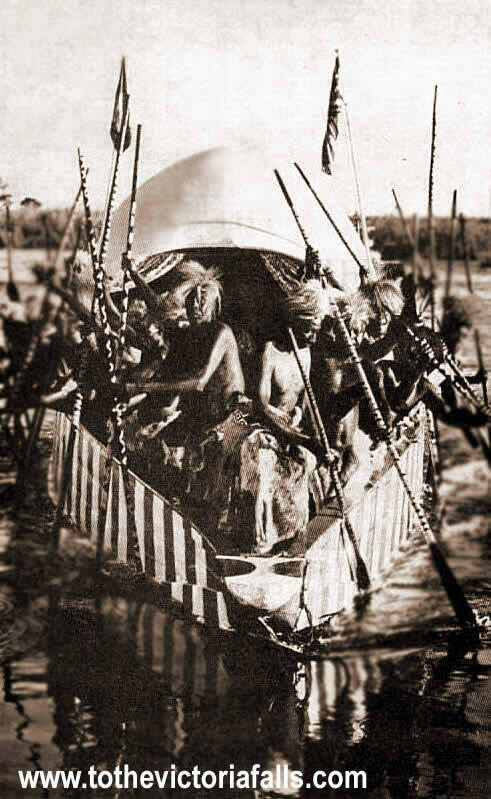 The Nalikuanda was followed by a boat containing the magistrate and our missionaries. In another large boat were the European traders of the country, followed by the innumerable canoes in which the Barotse were arriving from all parts to pay the last honours to their chief. After two hours' rapid navigation the cortege reached Nanikelako, a wide shoal emerging above the flood, where Lewanika had built a large hut covering the very place where he was now to be buried. The hut had been pulled down, and on its site the trench was being dug, about 10 yards square by 3 ½ yards deep. It was not finished when the canoes arrived, and a halt had to be made under the burning sun till it was completed. This was not for some hours. At last the royal canoe was brought close to the tomb, borne solely by Barotse of pure race. Custom rules that the boat itself should be placed in the trench and that Lewanika should be in it stretched out, his face turned to the east, but for some unknown reason the body was lifted out and placed in the grave, magnificently installed under a pavilion covered with superb mats, and around it everything the deceased could possibly need on his last journey: magnificent furs, fly whisks mounted on ebony and ivory, decorated with beadwork, pottery and carved wooden bowls, etc. When all was ready, the sun was low on the horizon. The voice of Lewanika's brother, Mui Mui, was heard. Only the royal family and their European guests might remain near the tomb, all others must retire behind the screens of matting put up for the purpose. The reason? Lewanika, like his predecessors, was now about to become a divinity, and the common people must not witness the climax of these mysteries. A native perfume was now flung into the tomb; baskets and baskets full of a fine scented powder which rose in a dense rose-coloured dust and hung in the air while the corpse was being placed within the tent of mats. This rite accomplished, the screens of matting were removed that held off the crowd, and the missionaries conducted a very brief service—all there was time for before sunset. Night falling, the grave-diggers were left alone to fill up the trench covering the innumerable things brought by the Nalikuanda ; and to erect a fence all round this tomb, which henceforth becomes a national sanctuary. The next day they began to slaughter cattle on the tomb, 170 were thus immolated. The crowds having returned to Lealui, an important ceremony was enacted, namely, the Proclamation of Litia as his father's successor. M. Jalla also gave me an account of how Yetta, the present chief, kept his vigil before his enthronement. This is a most interesting and significant custom. The first thing essential to the kingship of the Barotse is the royal drum, all the royal drums in fact, but one of them especially on which the king must take his seat while the people acclaim him. We have something answering to this in the stone of Scone under the Coronation chair. The traditional place for it is Katuramoa, some distance from Libonta. "It is there that Noio, the distant ancestor of the royal family, received his kingship, and no king can be recognized as such if he has not been there. When the country was occupied by the Makololos (as Livingstone found it), the royal family had fled to Nijengo (northwards); they had succeeded in carrying off the Nalikuanda (the State barge) and the Maoma, the enormous drums, and these are the insignia of royalty. But the ceremony of Katuramoa was lacking. This is so indispensable, that notwithstanding the danger, they descended the river so far, accomplished the rites, and the next day, having returned to Nijengo, the drums were beaten and the king was regularly nominated." Litia, as he was then called, was at Sesheke when his father died somewhat suddenly on February 4, 1916, and it took some weeks for him to receive the news and travel to the capital. He arrived there incognito late at night about March 11, and set off at break of day with a few chosen companions and the big national drums, the maoma so called, in the royal canoe or barge manned by chiefs alone. On reaching the spot up-river which M. Jalla pointed out to me, Litia landed with his friends. His goal was the tomb of an ancient king and ancestor marked by a giant fig tree. Here he was met ceremonially by the guardian, who in former times would have been regarded as the priest of its mysteries. Litia, however, as a Christian had abjured all heathen rites, and only observed those to which a merely national significance could attach. Leaving the barge and its crew in the river and his friends at a little distance, and divested of almost all his clothing, Litia spent the night watches under this tree alone with his weapons and fasting. No one knows the essential secret of it. The Gambella (Prime Minister) said to M. Jalla, "If anybody professes to impart it to you, do not believe him. He will not be speaking the truth. It is forbidden to utter it." This much, however, has been told. At the first streak of dawn he had to dig up a tuber and drive it towards the river with his lance. On the way, his fellow watchers met him, overjoyed to find he had survived the experiences of the ordeal, whatever they may have been. They now invested him with his royal robes, in this case a gold-braided uniform and cocked hat presented to his father by King Edward VII. One or two of them at once kindled the ceremonial fire, made by rubbing sticks together, and carried it to the barge in a broken crock. The others helped him with their lances to drive the tuber forward like a golf or hockey ball. As it touched the waters of the Zambesi, the chiefs in the barge beat the drums in token of his accession, dating from that moment. He embarked with the companions of his vigil, and was rowed down the river by his chiefs, all dressed in red kilts and antelope skins and shawls of ceremony, and wearing the red caps and head-dresses of lions' manes, which form the insignia of their rank and are awarded by the king himself. The booming of the great drums never ceased, and the sound borne forward by the current announced to all the neighbouring villages that their king was on his way, and the people rushed to the banks to acclaim him. This they do by shouts of "Yo—sho," standing in the water and tossing it over their heads with their hands. In the bright glittering sunshine this is a beautiful ceremony. Originally it was an invocation to the Sun from whom the sovereign — Le Roi Soleil — is traditionally descended. Then, launching their canoes, they follow the royal progress. The Accession of Litia (now called Yetta) as Paramount Chief of the Barotse Nation. Monday, March 13, had been fixed for Litia's return, and his official installation as Supreme Chief or King of the Barotsi. Towards 11 a.m., in radiant weather and under a burning sun, we crossed in a skiff the space, now flooded, which separates the station of Lealui from the landing pier of the capital. Far off, the faint throbbing of drums announced the new king's progress on his way. An immense crowd, which we estimated at more than 15,000 persons, crowded around the approaches to the little port, and flowed back to the extreme limits of the space still spared by the inundation. All this seething and stirring crowd was nevertheless remarkable for its orderliness, due no doubt to the fact that it had organized itself naturally into companies or regiments with their chiefs at their heads—all vassals or liege-men of the new king, as they had been of his father. The time of waiting prolonged itself for more than an hour; still the repeated beating of the drums balanced on the canoes that accompanied Litia, announced to the joyous crowd that "To-day we have a king." What a spectacle was this immense crowd, composed of elements quite foreign to the capital, foreigners themselves, some with long-tressed hair, others clad in wild-beast skins, people from the north, south, east and west, speaking strange tongues uncomprehended by the young Zambesians. At last the drums sound nearer, the royal canoes pass under the Sautter foot-bridge, which overhangs the canal dug by Lewanika; they are now between Loatile, the station, and Lealui, the capital. They arrive—they turn off—now they are far away—now they return ; they are about to enter the channel leading to the pier ; no, they are going back again ; they are tacking ; they display a singular coquetry demanded by etiquette in withdrawing. It is one symbolic act the more among all those by which this extraordinary Barotse nation lives, a symbol full of beauty and delicacy. The new king would seem to say: "You are waiting for me, a joyous, an excited crowd! But I cannot respond to your desire, for my heart is mourning for my father. You call on me to succeed him. But I cannot bring myself to do so. I come, since you require it of me. But no! I cannot! I turn back." 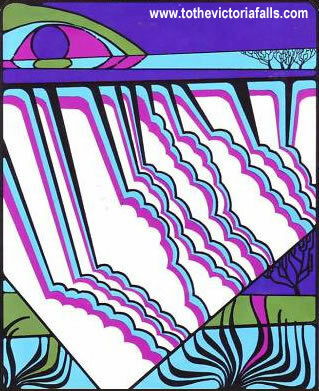 For more than twenty minutes the various craft were performing evolutions, first on the sheet of water studded with lotus-lilies and then on the green water-meadows, where the tall grass hides the inundation of the clear transparent floods. What nautical prowess! The paddlers, in red caps, adorned with lions' manes, surpassed themselves: and their bronze limbs, admirably proportioned, were streaming in the sun. And all this time the big drums were announcing to the whole valley (for they can be heard forty miles away in flood time) that "To-day we have a king. "At last, and abruptly the canoes enter the channel, and approach, gliding swiftly and as if clearing the crowd. The latter rises to its feet and the formidable royal salute bursts from every breast, "Yo! sho! Yo! sho!" The arms are thrown up towards the sky, and lowered only to be upraised again, while the thunder of acclamation rolls over this immense crowd. The royal canoe has landed; complete silence falls; five minutes pass; the big drums are lifted by the paddlers in unison, and rolled towards the Council square. Here they will be beaten incessantly. Next, fire was brought ashore; a fire which is specially lighted for the new king. This fire is carefully brought to the public square. Finally, the mat which forms the entrance to the royal landing-place is drawn aside, and Litia emerges evidently much moved, almost pale in his gold-braided coat, his hand on the gilded hilt of his curved sword. The crowd acclaims the prince, who, whether by etiquette or swayed by real emotion, is leaning upon the Gambella (Prime Minister). All the members of the British Administration, and of the white population who are present, accompany him, whilst his faithful paddlers form a bodyguard between him and the crowd. The latter grows tumultuous; rough pushes occur, loud whistles echo around. Is it a riot? No, these are whistles of joy, it seems, which break out and almost shock our European ears. However, the procession has reached the great public place, in front of the Council Chamber, and there the Gambella assists Litia to take his seat upon a lioma [1 Lioma singular, maoma plural.] (national drum). On this the new king remains seated for several minutes in the sight of all his people. It is the final investiture. Litia is consecrated king of the Barotsi. Whilst Litia was seated on the big drum, the new fire was burning before him. It was then deposited on the public square, and there from every household in Lealui, the people came to procure new fire for their own hearths, after having put out the former fires. He now rises, and with a firm step proceeds to the far end of the Grand Place, where a gilded throne or Chair of State had been prepared for him, under the mahogany trees planted by his father. The members of the Government, the missionaries and traders, group themselves on his left, and his council somewhat in the background. Almost in front of him on the immense open space the crowd assembles, staves and wands upraised. It is a brief but significant fantasia; the war dance of the Barotse, silent but energetic. The principal magistrate then reads the Administrator of Northern Rhodesia's message to Litia and his people, after which the members of the Government and some of the merchants retire, and the crowd opens to let them pass. By the chief's authorization, the missionaries now take up the word. At the request of the Gambella prayer is offered by M. Boiteux, who commends Litia to God, as also this tribe among which so much has been done and from which we expect great things. The dispersion now takes place, while the members of the royal family come forward to kiss the hand of their chief and suzerain, and the crowd gives itself up to the pleasure of watching and sometimes taking part in dances and acrobatic performances by various performers of the Ma-Wiko, Ma-Nkoya and other tribes. In the evening, by a lovely moonlight in Litia's temporary court, most of us were enabled to hear a beautiful song of welcome sung by the Normal School, under the direction of M. Coisson. Only listening to these twenty-five young men, singing so splendidly and with such dignity, we were able to measure the immense distance which separates the Barotse of former days from the Barotse of to-day, and whilst a prayer closed this day, a hymn of gratitude rose from our own hearts also in moment of intimate peace toward God "Who hath done such great things for us!" Such was the (first) day's work, March 13, 1916, which witnessed the investiture on the throne of the Barotse, of the first Christian king on the banks of the Zambesi. LITIA'S ADDRESS TO HIS PEOPLE. Letter of Rev. T. Burnier. A REMARKABLE ceremony was enacted this morning at the Khothla of Lealui, which formed the culminating point of these festival days. The day before yesterday we had the noisy outward festivities where the traditional rites were observed with all their paraphernalia. Yesterday the popular rejoicings continued in the form of dances, songs and acclamations; and meanwhile the chiefs held a long council with Litia, but nothing was communicated to the public. Only, the people were warned not to disperse as yet, but to wait in order to take part in the Extraordinary Assembly of to-day. I had the privilege of attending this assembly together with my colleagues, Boiteux and Ellenberger. When we reached the Grand Place, it was filled by a crowd, the largest I have ever seen in this country. The public could look on at various dances executed by members of various tribes; all tastes were catered for, and some of the choreographic exercises were certainly remarkable. Suddenly the songs ceased; every one knelt; Litia was leaving his house and approaching the Khothla. Instead of his gilded uniform of ceremony he was attired in black cloth with a grey coat, and wore a tall hat, with the easy grace of a gentleman. He was preceded and followed by the serimbas, those wooden drums (xylophones), whose strange melody signalizes the official movements of the Zambesian kings. Litia took his place on the platform, and had three seats brought for us. The dances began again more energetically than ever and several groups came forward to lay their offerings [before him]; skins of wild cats, and carved wooden dishes. During this time the three chiefs who follow Ngambella in the Zambesian hierarchy were called up by Litia and received from him and from Ngambella the outline of the discourses which they would shortly have to utter before the people. Then Ngambella spoke in his turn and ended by these unexpected words: "Now keep silence, and listen with respect: the king is going to speak to you himself and to reply to the speeches." What an innovation! 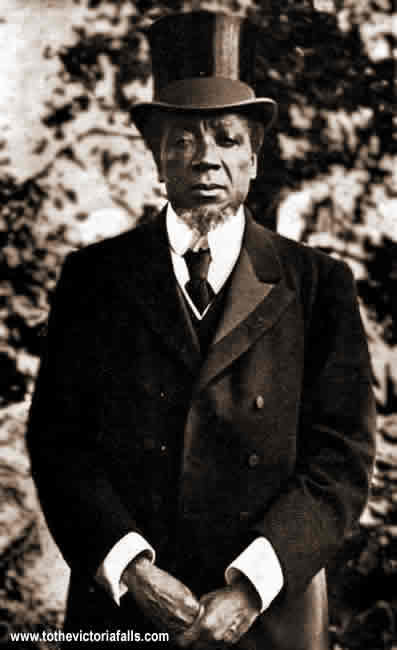 Lewanika never spoke in public: he gave his instructions to Ngambella, who spoke for him. Litia, breaking with this tradition, advanced to the edge of the platform. He held in his hand a paper on which he had made some notes, and the sheet was trembling between his fingers. It was a solemn moment: the new king addressing himself to his people for the first time! "Chiefs of the people, my first words will be a sincere 'Thank you' for the help you have always given to my father. Words fail me to express all the gratitude that fills my heart on this subject. Accept my thanks, all you chiefs and you Ngambella, for your faithful collaboration with the one who is no more. "In the second place I make a point of telling you that I do not intend to make any change in the staff of chiefs (i.e., in the Ministry), each will continue to occupy the place that was his in the time of my late father. The only case in which I shall make changes will be when the chief changes his mode of conduct ; and in that case I shall not act alone but with the advice of the Khothla. I have not time to speak in detail of our different laws, but understand that I shall uphold them. "One of the previous orators has spoken of the schools and their benefits. Schools are a blessing to the country—send all your children to them. Education and the preaching of the Gospel—therein lies the salvation of the country. Myself, I believe in God; others address their prayers elsewhere. Well, I declare that our only strength is in God. In vain to seek elsewhere; there is no medicine that can heal us. Our strength and our salvation are in God. "One word on the subject of the Government. You have heard the Administrator's letter; we shall conform to it. There, also, I wish to walk in the footsteps of my father. Order must reign, the country's future depends upon it. "And now I wish to return to what I said in the second place. If time fails me to speak of all our laws, there is one of which I wish to speak, and I emphasize it specially, for, if I do not do so, it will be said: 'The new king has not spoken of it; so he evidently attaches no importance to it.' It is the question of beer. I shall combat it as my father did. The people of Sesheke are witness that I have fought against it. Well, I declare, I bind myself solemnly that I will not drink it; you may lay me in my tomb before I drink it. Yes, I declare that I will have nothing to do with beer. "And now, from all of you, I ask your aid to assist me in the right conduct of affairs. But, before everything, and above all, it is to God that I look, and I shall go forward counting on God's help." Litia spoke with power; the paper no longer trembled in his hands. When he sat down again, Ngambella and the other chiefs went out of the building, where we remained alone with Litia. He then showed himself to the crowd, and the formidable " Yo-sho " which broke from these thousands of throats, the forest of arms upraised by one single impulse, responded to the simple and courageous speech of the new king. It was a fine spectacle and if Litia, the king, felt himself honoured by the unanimous homage of his people, Litia, the photographer, regretted that he was riveted to his throne instead of being able to wield his camera. He said this to us laughing; and Ellenberger pointed out to him that this was the first of the drawbacks inherent to his new estate of monarch. The crowd, guided by Ngambella, afterwards went to give the royal salutation to Queen Mokwae (of Nalalo), then to Mokwae of Libonta. Now the dispersal has begun, each returning to his occupation. The new reign had begun. A la garde de Dieu (God protect it). Macmillan H (2005) An African Trading Empire - The Story of Susman Brothers and Wulfsohn, 1901-2005. I B Tauris & Co Ltd, London.